The Bower Bird is Gould's rather poetical name for some inhabitants of Australia which, while he was in that country he ascertained, as on his return he announced (25 August, 1840) to the Zoological Society, to have the extraordinary habit of building what the colonists commonly called "runs". This discovery seems to have been mainly due to a Mr. C. Coxen of Brisbane. "These constructions", Gould correctly said in the proceeding of the Zoological Society in 1840, "are perfectly anomalous in the architecture of birds, and consist in a collection of pieces of stick or grass, formed into a bower; or one of them (that of the Chlamydera [Western Bower Bird, Chlamydera guttata]) might be called an avenue, being about three feet in length, and seven or eight inches broad inside; a transverse section giving the figure of a horse-shoe, the round part downwards. They are used by the birds as a playing-house or 'run,' as it is termed, and are used by the males to attract the females. The 'run' of the Satin Bowerbird (Ptilorhynchus violaceus) is much smaller, being less than one foot in length, and moreover differs from that just described in being decorated with the highly-coloured feathers of the Parrot-tribe; the (Chlamydera), on the other hand, collects around its 'run' a quantity of stones, shells, bleached bones, etc. ; they are also strewed down the centre within." 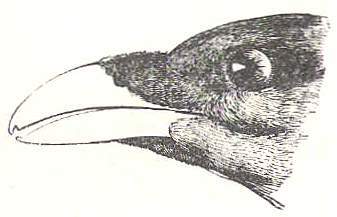 There is no reason to suppose that this extraordinary habit had been described before the date above given, or that the name "Bower-bird" had been previously used, and yet we find Trelawny in his Memoirs of Shelley, published in 1878 , referring to himself (i. p. 136) as saying, in a conversation not later than 1822, "You two have built your nest after the fashion of the Australian bower-birds. Gould's statement to the Zooligical society, marvellous as it seemed, has been proved by many subsequent observers to be strictly true, and it must be borne in mind that these structures (Gould brought home with him at least two examples, which he gave to the British Museum), each of which as above described Gould made drawings of in the following year (Birds of Australia iv. plates. 8, 10), have nothing to do with nests of the birds. Indeed, their mode of nidification, which was not made known until some years later, and the nest itself presents no extraordinary feature. Moreover, the birds will build their "bowers" in confinement, and therein disport themselves, as was repeatedly recorded by observers of the Satin Bowerbird in the London Zoological Gardens in the 19th century. Subsequently it was found that the Regent Bower Bird, Sericulus melinus, a species long before known, had the habit of making a "bower" of similar kind, though built, so to speak, in another style of architecture, and having for its chief decoration the shells of a small species of snail.